With the sweet smell of manure in the air, developer/civic patron Jordan Schnitzer gathered 70-some city leaders on a chilly May morning in the Portland Police Mounted Patrol’s paddock. 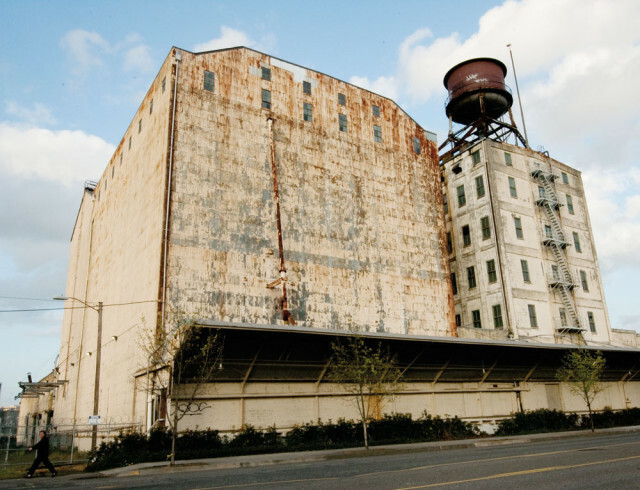 As the occasional horse sauntered by, the assembly brainstormed the future of the hulking ruin next door: Centennial Mills, one of the most tantalizing and problematic development sites in the region. A collage of 10 distinct mill and storage buildings, Centennial stands iconically—or, at least, immensely—on the Willamette River’s edge (half of the complex stands on pilings over the water itself) at the Pearl District’s northern end. It ceased milling and storage operations in 2000. The Portland Development Commission bought the 4.7-acre site and its picturesque but dangerously ramshackle spaces, some dating to 1909. The city’s been trying to figure out what to do with the place ever since. Wise old-guard developers like Al Solheim and John Carroll, who conjured the Pearl District’s mix of historic renovations and new buildings, have long thought the complex should be torn down to free up the prime riverfront land. But preservationists like the late Art DeMuro argued that Centennial’s crumbling spaces should be reused—somehow—to save a piece of the city’s industrial waterfront heritage. In 2005, the Portland City Council agreed with the latter view. The PDC held a ballyhooed design/development competition in 2008, but never sealed a doable deal. Next up: Schnitzer, who helped his late father build a West Coast-wide empire of office buildings, hotels, shopping centers, and industrial parks. Now, he aspires to channel that purse toward “legacy projects,” like his funding of Director Park and restoration of the Astoria Column. He’s enlisted Portland’s former planning director Gil Kelley, the artist/urban designer Tad Savinar, and internationally renowned landscape architect Laurie Olin. With all due respect to those grand visions, I hereby cast an alternative vote: do as little as possible—at least for now. Sure, save a building or two (or maybe even just a wall) as a nod to history and texture. Otherwise, clear the site and harvest the original construction’s bounteous old-growth lumber. Then, maybe put up some temporary structures for creative endeavors: tech incubators, flexible “makers” factories, artists studios, or all of the above, that can painlessly vanish in a decade or so. Above all, maximize the space and opportunities for future ideas. The mills’ greatest connection to our river heritage lies underfoot in the site’s piers. This is the only significant place in Portland (other than at the Newport Bay restaurant) where you can be overthe Willamette. The greatest legacy Schnitzer could leave here would be the opportunity for the bigger city we are becoming to decide its fate. Portland shines best globally when it takes the long view. On May 28, Stephen Person, our former intern and regular freelance contributor, died at age 28 after a tragic accident. We dedicate this issue to him. Visit portlandmonthlymag.com/stephen-person to see some of what his short but creatively rich life gave to us and his many friends.